The artist and collagist Adèle Blais draws inspiration from her childhood and the people around her, to create dazzling, inspiring work with a hint of romance. She loves to deconstruct and reinterpret the human condition. 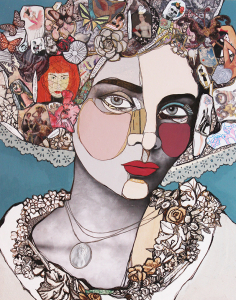 The artist’s unique style marries photography, painting and textured collages with a sprinkling of well-chosen words. Her eye-catching artwork showcases female figures clad in vibrant, theatrical costumes. Her current show depicts women who have left their mark on the world – from Claudette Colvin to Simone de Beauvoir. Ceramics, a dreamy dress and a collection of magnificent masks, round out this exciting summer exhibition.